I'm sick as a dog so forgive me if this is disjointed. Chris has successfully worked for a few weeks and is continuing to work. Surgery is still on for September 29th. Chris's best friend is moving in with us next week. Christopher continues to be a mini engineer. The landlord texted me to let me know that unlike that past few months he can't wait for the rent, because he's going to be gone the next two weeks. So rent has become a pressing priority with a shorter timetable. So we're getting there, but we still need help. I've still got a GoFundMe set up and PayPal to chris@chrisbyrne.com always works, as well as Messenger for me. I'm going to go take meds and pass out for the night and hope my vertigo is gone tomorrow. Chris has been working for a week and a half. The entire household is going through an adjustment period, the doggies in particular. Last week one of the sprinklers in our house fire suppression system failed, resulting in lots of water in a short amount of time. We ended up laying out cash for a wet/dry vac and mold inhibitor. I've been working on cleaning up the mess and preventing mold and mildew for a week. Chris's health seems to have plateaued, in that he's not really getting worse (except the lymphedema is somewhat worse) but he's not getting better. The lymphedema is a real issue and causes him quite a bit of pain and discomfort. Surgery is on September 29th. I seem to be getting sick, either from a cold or dealing with mildew as it occurs. Frankly it's a challenge to write this post, that's how sick I feel. Chris will be getting paid soon, but we've got rent, cell phone, electric, internet, meds, health insurance premium, and food to pay for until he does. So while we hopefully won't need much (or any) help soon, we still need it for now. I've still got a GoFundMe set up, and PayPal to chris@chrisbyrne.com always works, and Messenger payments work really well. A simple test of understanding, to avoid wasting time. I have a simple test for people, to determine whether or not they actually understand enough about the issue of "Climate change" to have an informed position on it, or whether it's just a question of ingroup identification for them. I.e. whether they actually know what they're talking about, or whether they're just repeating what "their side" are supposed to say. Here it is: Explain your understanding of the theory of catastrophic anthropogenic climate change. Yes, really, it's that "simple"... but their answer will be quite revelatory. Most people will say something like "greenhouse gasses like co2 emitted by humans are making the climate change, and if we don't dramatically change how much energy we use, the whole planet will suffer" or something similar. That indicates but doesn't confirm, that they have absolutely no idea what they're talking about; they're just repeating what they were told. Well then... they don't actually know anything about "Climate Change". They just know what team they're supposed to be on, and what that team tells them to say. I thought I'd write a bit about the Remington R51, because a lot of friends really like the look of it (and the original Remington model 51 it was based on) when they brought it out a few years ago, and they were very disappointed when it proved so unreliable that Remington had to discontinue production and recall all the shipped pistols. Recently, Remington brought out a revised version of the R51, and it has come back to mixed reviews; some stating it had fine reliability, and some that it had better than the first production run, but still poor reliability. Watching the testing, I think I have a pretty good idea of what's wrong... and I thought I'd break it down here. Basically, the only ammo it would run cleanly with, was the hot German 124gr NATO round nose FMJ stuff. It had just one total failure in about 200 rounds of that ammo. That's very good ammo by the way, and my favorite factory load for breaking in difficult 9mm pistols, and for shooting through subguns and 9mm carbines. You used to be able to get it pretty cheap by the "battlepack", but I haven't seen any available lately. The remainder of 8 ammo types tested were averaging one malfunction per every other mag of brass ammo, and the weapon wouldn't run any steel cased ammo at all, with one or more malfunctions per magazine. 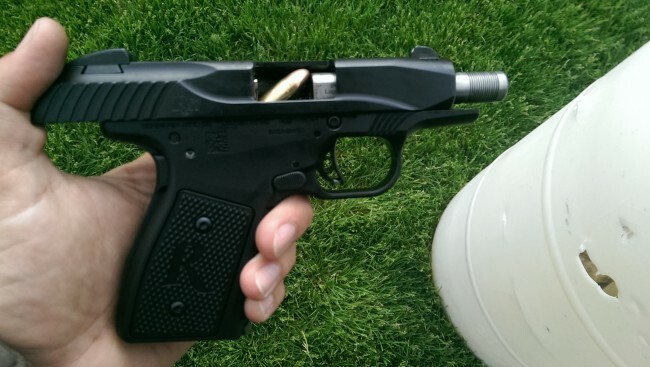 Essentially all the malfunctions with brass cased ammo were nosedives, most of which the slide overrode. This normally suggests that the magazines are the primary issue... as is generally the case with MOST self loading firearm malfunctions. Given the 124gr nato ran very well, and all of the other ammo did not... most of it was lighter, and if it wasn't lighter it was hollowpoint... It seems the weapon is extremely sensitive to cartridge OAL and nose profile. The German 124gr nato ammo has a long ogive nose profile, making it a couple millimeters longer over all, than either a 124gr JHP, or lighter FMJ or JHP loads (its also longer than 124gr winchester white box, which has a shorter ogive and a rounder more spherical nose profile). That NATO spec ammo is also hotter than most ammunition... in between an American +P and +P+... It will result in higher slide speeds and energy, even with the "Pedersen Hesitation Lock" blowback action, because it's a modified blowback system that locks the barrel and breech block together until pressure drops, but it still has much more energy hitting the slide earlier in the timing cycle, than a Browning or Walther style locked breech operation (and because it pressure dependent, it is much more sensitive to ammunition variability). What this suggests to me (as an engineer, a gunsmith, and a shooter) is a combination of timing, and magazine issues. Hesitation lock weapons are almost always going to run better with hotter ammunition, and may be unreliable with lighter loads. Also, cartridges that obturate differently, or that have different lubricity and stiction (such as steel cases vs. brass), may dramatically alter the timing of the weapon compared to brass test loads. If you tune an action to run reliably with lighter pressure ammunition, with hotter ammunition it's more likely to unlock too early, and possibly malfunction, accelerate wear, or even have a catastrophic failure. If you tune it to run reliably with hotter ammunition, though it will be less likely to have safety and durability issues, and will wear less; it may be unreliable with lower pressure loads. It's a delicate balancing act that's difficult to manage even with all other factors being perfect. Adding steel cases which obturate in the chamber very differently, and which have dramatically different friction characteristics, just adds another set of issues to the tolerance stack. That's the timing issue. But, while the other +P ammunition also ran better than the standard pressure, it still had problems... thus the magazine issues. Its likely that the magazine lips and follower are presenting the cartridge too far back, and too low, at too shallow an angle, and with too much friction on the cartridge. This combination would cause the feeding cartridge to tilt nose downward too far... without moving forward, or at least before it moves far enough forward... thus a cartridge with too short an OAL may fail to engage the feed ramp, and instead slam into the front of the magazine. Since the slide is overriding the cartridges instead of jamming on the rims, it also means it's pushing the cartridge stack down far enough, with little enough effort, to continue its stroke. The failures with steel cased ammo were mostly nosedives as well, but there were also FTI failures, from light primer strikes. They had nosedive failures every few rounds with steel, which doesn't surprise me, because steel is going to have higher feeding friction, against the mag lips, mag follower, and the rounds under it. Thus the nosedive problem would be exacerbated. The light primer strikes are lightly due to inadequate force exerted on the firing pin, rather than any more complicated issue. Both of these issues indicate to me that they used springs that are either too light by spec, or too soft by QC, both for the internal hammer, and for the magazine. These spring issues are common failures in quality control for any manufacturer, and common problems with any self loading pistol... and frankly, are not surprising given the state of Remingtons manufacturing and quality control issues over the past few years. When the geometry and timing of a design are just barely on the edge of being reliable, a slightly soft spring can easily make the difference between a weapon that runs, and one that doesn't. So... what do you do to fix it? As a manufacturer or a gunsmith, there some relatively simple changes that might help. First, I would try a slight revision in the mags and mag catches, to make the magazine sit just a little bit higher could improve feeding function; as could a slight easing of the feed lips, reducing friction on the feeding cartridge, and presenting it in a slightly more nose up attitude, allowing it to move further forward with less pressure; thus making it easier for the cartridge to engage the feed ramp and jump up under the extractor, rather than nosediving (particularly for shorter OAL or steel cased cartridges). If one has an R51 that is overly load sensitive, and has similar issues, and changing to a stronger mag spring doesn't resolve them, then one could try easing the feed lips slightly themselves, as well as polishing them with emery cloth, to reduce feeding friction. Other than that... There's not much you can do, except to internally blueprint the gun... polish metal mating surfaces, deburr anything that would be in a feed path etc...; and make sure that your springs are good. Self loading firearms are all going to be sensitive to timing, ammunition variability, magazine geometry, quality control in springs and mags, and quality control in general; and pistols doubly so over rifles, since you've got much less energy and much shorter distances and time windows to deal with. Honestly, it's pretty easy to make one unreliable, and pretty difficult to make one reliable. Using a locked breech design helps reduce the variables, and make them less sensitive, which is why you don't see many full power centerfire pistols that don't have a locked breech mechanism. Even the original Remington model 51 was only available in .32acp and .380acp. There's good reason why blowback pistols... even modified blowback pistols such as the R51... above .380acp in power are rare. You're already cutting your tolerances close and stacking them high... when you add questionable quality control on top of it... well... the results are... predictably unpredictable shall we say? But Maybe It'll be Different THIS Time... Right? ... and further, somehow people don't understand, that the best interests of government, are NOT the best interests of the people. Of course they're not. If they happen to coincide, it is a happy accident, or its because they are catering to a specific interest, to gain support, power, and resources. Somehow, people seem to persist in this utterly irrational set of beliefs, that government is "looking out for them" against its own interests, no matter how much evidence there is... basically the entirety of history... to the contrary. Even when they acknowledge that this was "sometimes true in the past", or sometimes they think "now it is anyway", they blame outside factors like "corporate corruption" and "special interests"; rather than seeing and accepting, that the government simply acts in its own interest, and that when it doesn't, it's an exception, not the rule. Somehow, they keep convincing themselves, that the "right people" will really "fix it", and "look out for them". Somehow, they keep thinking "this time, if we just get people who are good enough and smart enough... this time, it will be different". Never mind the proof presented by all of history, it won't be, because it can't be. Well... this is going to take a while... but let's simplify as much as possible, and start with breaking down some core assumptions and fallacies. "The government acts in the interests of the people". It doesn't. And it's not because of "corruption" or "corporate money" or "special interests"... or at least not as most people think of those things. The false dichotomy of "Corporations and special interests vs. Government, acting in the interests of the people", is so obvious, I really don't understand how anyone can possibly believe it at this point. But they do... in their millions and billions. The problem at core, seems to be that people confuse and conflate the government, with the nation, and the people as a whole, as if they were one thing, or at least always aligned together collectively. They then believe that somehow "corporations" and "special interests", are some kind of other thing, acting against "the people", for which "the government" is their champion, advocate, and defender. These false notions, completely ignore the fact that the corporation itself, is a special creature of government, created and protected by the government. That without special status granted by government, and the special protection of government, corporations are nothing but a voluntary collective of individuals (theoretically acting in common or aligned interest), with no power or protection greater than any individual. ... That's also what a government is supposed to be right, except the "common interest" is supposed to be "the common interest of all the people", right? Of course, by creating, protecting, and then catering to these protected institutions; the government, and those within it, secure their own positions, and gain power and control. With this power and control, they then create more protected interests and institutions, cater to them, and receive even more power and control in return, in a self reinforcing cycle. "Corporations" are not opposed by government. Protected institutions and interests, such as corporations, are creatures of government. Neither can exist, or thrive, without the other. More importantly, neither are acting in the interests of individuals outside of themselves... nor should anyone expect they would... their purpose is to act in the interests of those who make them up. That's the very definition of "special interests" by the way. No, actually, it's not. It's corruption if there is a quid pro quo of cash or similar value, in exchange for a specific vote... But mostly that's just what politics IS. People have interests, they gather together in groups, those groups act to further their interests; be it a political party, or a town historical society, or a private club, or a business, or a union. They try to get the government to act in the way they want, and competing interests try to get them act in the ways the competing interest want. Here's the thing though... Government is just another corporation... another specially protected institution, and "special interest"... composed of the same people who make up every other corporation and "special interest". They are just another institution acting in their own interest, like all institutions do. Yes, that's right, the government itself, is just another "special interest". And the government, acts in its own interest. Not yours, or mine, or "the peoples"... It's own. So... how can two "special interests" created by, protected by, supported by, and supporting, each other; be truly opposed to each other, except in competing for power and resources with each other? How can one "special interest" be acting in its own interest, and the other "special interest"... the government itself... be acting AGAINST its own interest; by instead acting in your individual interest, or in the interest of "the people" as a whole? It should be obvious that it can't. "The People" don't actually exist. "The people" is a convenient fiction, to represent all the individuals within "the nation", all of whom have their own interests; sometimes aligned with the interests of others, sometimes opposed to them, sometimes competing with them. "The Nation" as a whole can have unified interests, such as advantageous foreign policy, and national defense, and the overall safety and prosperity of "the nation" is in the common interest of all the people... but that's not exactly equivalent. In fact, often, what is in the best interest of the nation, is not in the best interests of many of the people. So, it's not actually possible for ANY government, no matter how well run, no matter how well intentioned, and no matter how well structured, to act for "the people"; except in the broadest possible terms. Yes, really... no government, of any kind, ever. That's not a "broken system" or a "perversion of the system"... that's how any system will always be no matter what, because it cannot possibly be other way. There is no other way. No matter what, that's the way it is, because there is no other way. As an individual, at best, government can be a disinterested third party... or if you are very lucky, its interests can be aligned with yours for a time, on a particular issue or set of issues. Often, government is just another "special interest" colluding with other "special interests", against your interests; lying to you about it, and stealing from you to pay for it. At worst governments interests... or the interests it is catering to against yours, in order to gain more power and control... require you be made powerless, or removed; and it strong arms, bankrupts, imprisons, or kills you... And along the way, maybe it steals everything you and your family had, and labels you as an enemy of all "good people". Because that's what government is... it's not just a "special interest", it's a "special interest" that has the power and authority, to take from you at gunpoint, force you to comply with its orders, imprison you, and kill you. The true dichotomy, is the concentrated power and force of specially protected institutions and interests... including the special interests of the government itself... vs. the diffuse power and interests of Individuals. By the by, this isn't some random theory of my own... I'm just simplifying it and stating it in plain language. In politics, economics, and sociology; these are known as the agency problem, and the problem of concentrated benefit, and diffuse cost. They're inherent to all governments, and in fact in all other collective institutions and efforts, and they cannot be solved, only mitigated at best. In the extreme, this means that without some countervailing concentration of power to stop them; the strong will always tend to overpower the weak, and the majority will always tend to overpower the minority. Also, we actually do need a disinterested third party to resolve disputes (courts), to administer property held in commons, and to coordinate collective efforts for the nation as a whole (such as foreign policy and national defense). So... we can't get rid of special interests, or concentrated interests and powers general, and we can't get rid of government in particular. Since that is so... Don't you think it would be best if we would give those specially protected institutions and interests, and those concentrations of power against individual interests... as little power as possible? Because if we give them the power to act in our own interests today... aren't they just going to turn around and use that power to act against our interests, when it's to their advantage to do so later? ... but maybe it'll be different THIS time... right? I was asked why I love guns, by someone who has an instinctive revulsion towards them. That's a rather important question. Aside from the fact that they are by far the most effective means of self defense, and defense of others, and that I have used them for such purposes multiple times? Aside from the fact that they are used for such purposes millions of times every year? Aside from the fact that it is enormously fun and satisfying, to develop skill in using them, and in competing with them? They are one of the finest examples of both human mechanical craft, arts, and precision... and in their use, of our martial arts. They're very interesting pieces of machinery. Moreso, they embody a fascinating set of interactions between machinery, chemistry, physics, and human performance. ... There's the inescapable fact that, before guns, most of humanity, throughout most of history; were ruled by hereditary warlords and despots; trained from birth in, and oppressing the people by, main force; which they maintained a monopoly on (no matter how you might want to pretty them up, calling them nobility and royalty, lords and kings and emperors). ...There is only slavery, and the tyranny of the strong over the weak, and the many over the few. I would love it to be otherwise, but history has proven over and over again, that it is not. Throughout all of history, the only thing that has ever successfully prevented, resisted, or overthrown tyranny; without immediately replacing it with a different tyranny.... has been an armed, educated, and free populace. Guns are literally the only reason why modern relatively stable and nontyrannical governments can exist at all. They are the ultimate protection for the weak, and the minority, against the strong, and the majority. The gun IS modern civilization. So... we weren't able to sort out insurance in time for the established surgery date. Yeah... there's lots to be said about that, none of it good. It IS being sorted out, it WILL be authorized, and I will be on everyone's case until it is. Once it's authorized we'll get a new date. Unless we can pay the $40,760 to the hospital before the surgery, which seems highly unlikely. The okay news is that while Chris is in pain and the lymphedema is really bad, it doesn't seem to be getting worse. We still need to get him a pool and a hot tub for hydrotherapy and exercise equipment, and that's a high priority in order to prevent further muscle loss. The good news is Chris most likely has a contract that will work with his appointments and time off for surgery and radiation so maybe we can start digging out of this whole. The bad is we can't make rent and we need to wait even longer for surgery. But there's a few lights at the end of the tunnel at least. So we still need help, rather desperately. Anything would help.